The are the known constant. The are the unknown variables. The problem in linear equation is to find the values of the unknown variables that satisfy the equation. For example, when , and we have linear equation and the solution is . A solution of the linear system is an ordered collection of numbers that satisfies the linear equations, which can be written in short as a vector solution . The interactive program below will help you to solve a system of linear equations . To use the program, first you need to transform your system of linear equations into matrix format as explained in the example above. Your input is matrix coefficients and vector constants . Then you click “Solve Linear System Ax=b” button and the program will produce the vector solution . Optionally, you can select your output is either in decimal or in rational format. The rational output is an approximation of the decimal format. When you click “Random Example” button, it will create random input matrix to provide you with more examples of linear system. Note that if the coefficient matrix is singular or nearly singular, you will get only the approximate solution in least square sense using generalized inverse such that the error is minimized . A linear system is called non-homogeneous system when vector is not a zero vector. A linear system is called homogeneous system because vector is a zero vector. Rank of matrix denoted by is a scalar number to determine whether the linear system is consistent (has a solution), has many solutions or has a unique set of solutions, or inconsistent (has no solution using matrix inverse). Diagram below shows the solution of the system of linear equations based on rank of the coefficient matrix in comparison with the matrix size and rank of the augmented matrix coefficients and the vector constants , . has infinitely many non-trivia solutions if and only if the matrix coefficient is singular (i.e. It has no inverse, or ), which happens when the number of equations is less than the unknowns ( ). Otherwise, homogeneous system only has unique trivia solution of . General solution for homogeneous system is where is an arbitrary non-zero vector. When the number of the unknowns in a linear system is the same as the number of equations ( ), the system is called uniquely determined system. There is only one possible solution to the system computed using matrix inverse . When we have more equations than the unknown ( ), the system is called overdetermined system. The system is usually inconsistent with no possible solution. It is still possible to find unique solution using left inverse . 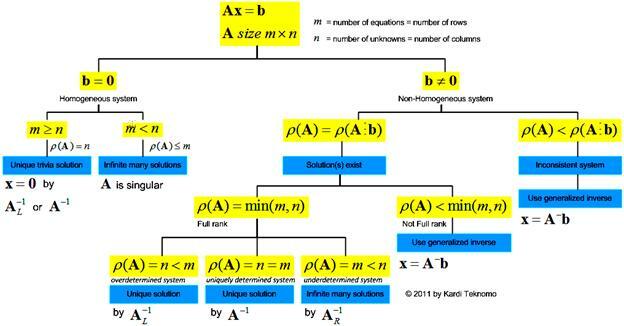 When you have more unknowns than the equations ( ), your system is called underdetermined system. The system usually has infinitely many possible solutions. The standard solution can be computed using right inverse . When non-homogeneous system is not full rank or when the rank of the matrix coefficients is less than the rank of the augmented matrix coefficients and the vector constants then the system is usually inconsistent with no possible solution using matrix inverse. It is still possible to find the approximate least square solution that minimizes the norm of error using generalized inverse where is an arbitrary non-zero vector.